From concrete to Cheetos, this designer makes a glittering mark in a male-dominated business. When not designing furniture or interiors, Portland-based creative Sasha Burchuk pours concrete. It’s the foundation for all her dazzling gemstone terrazzo artistry that’s caught eyes nationwide. The critical, behind-the-scenes, heavy-lifting that comes before her New Age Design Studio sparkle is what has earmarked her as one of the few females in the country doing what she does. Terrazzo dates back to 18th century Italy when construction workers sealed marble fragments into terraces and other surfaces. This style of Venetian pavement became a mosaic-like art form all over the world. Knowing nothing about concrete, she started making terrazzo samples in her driveway. After mishaps with bag mixes, too much water, and paint, Burchuk sought out an apprenticeship to learn on the job while joining the Mt. Hood Rock Club to learn how to use a lapidary shop. 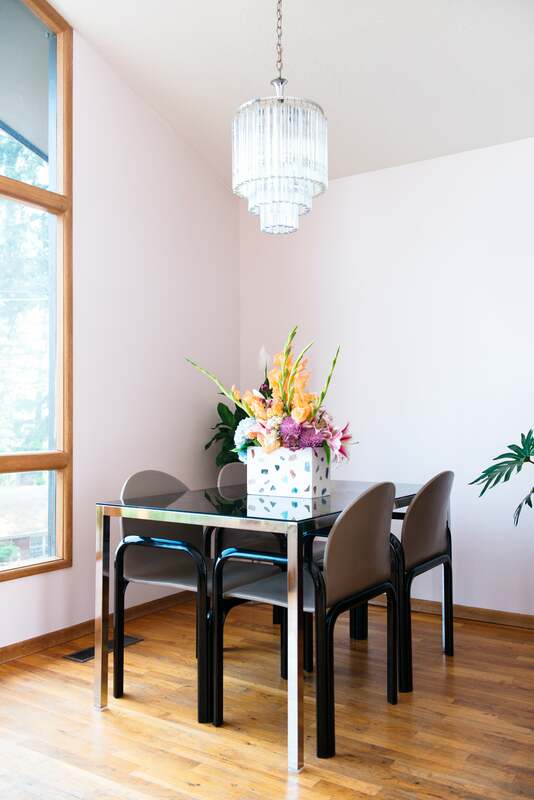 After a year and a half working on material, she launched New Age Design Studio in 2017, working closely with clients and selling pieces, such as her famous Gemstone Terrazzo Cube Table which has a honed terrazzo tabletop atop an Oregon Walnut or Eastern Maple base, directly on her site. With more pieces and collaborations in the works, she’s constantly creating, while traveling to gem and mineral shows and scouring secret spots and exotic beaches from Greece to Denmark for the best rocks, marbles, and granites. Next, she lays the material out in a mold, art directing how it will look. “I try to create an organic flow of movement throughout the piece and find some sense of balance when it comes to placement and the use of color,” she says. When layout feels complete, she mixes a batch of concrete (cue the 94-pound bags! ), which she notes has to be done carefully and methodically to render a strong and durable material. A face coat of the mixture gets drizzled over the entire mold, and when it’s thick enough, machinery mounted underneath the form table vibrates out the air bubbles that get introduced during the mixing process. Once the rest of the concrete is poured and the mold is completely full and level, the piece gets heated and cured for 48 hours. Afterward begins the demolding—a process of grinding and honing to even out the surface until it feels smooth and starts to reflect some light. Then comes a heavy wet processing tool called a UFO (the same ones marble fabricators use) that polishes the surface before the muriatic acid is etched in so that sealer will adhere to it. After the piece dries out for several days, Burchuk can finally pick up her blowtorch and apply multiple layers of sealer. It may look pretty in the end, but it takes superpower steps to get to this state of sparkle and originality.